If our users are using Question and Answer Bot (QnABot), and they are getting the right answers for their questions, what else can you do for them? Now you can create a bot to guide them through a series of logically connected answers. This means, for example, that the bot can guide them through the steps of a recipe, or the bot can help them navigate through the exhibits in a museum tour. This avoids the problem of giving users too much textual information. Instead, by using the bot, it becomes easier to split the information your users need into smaller navigable steps. In this blog post, we show you how to use new functionality in the QnABot to create a virtual tour that includes tour stops with descriptive text and images. Your tour can represent physical locations (such as rooms or exhibits), instructions (such as steps in a recipe or tutorial), or abstractions (such as topics or concepts in educational material). For this blog post, we’ll create a guided tour of the primary sites of the Prairie Line Trail by using the interactive map created by the City of Tacoma and funded by the Washington State Historical Society Capital Heritage Grant program. AWS Lambda hooks provide you with the ability to add dynamic responses to your documents. By utilizing a new custom Amazon Elasticsearch Service (Amazon ES) feature, those dynamic responses can be other documents. By leveraging the Lambda hook functionality, the Amazon ES functionality, document fields, and client-side attributes available in the QnABot system, we can add interconnectivity between documents and create modalities such as a guided tour. This blog post uses the Question and Answer Bot (QnABot) originally developed by Bob Strahan and John Calhoun. You should click this link and read the blog post to understand how QnABot works. This post includes a discussion of the new Lambda hook functionality, which we’re using here to implement guided navigation capability. In the CloudFormation console, on the CloudFormation Parameters page, enter a valid Email and Username for the QnABot Content Designer admin user. Choose Next twice to display the Review page. ContentDesignerURL: URL to launch the Content Designer UI. ClientURL: URL to launch the user client webpage. In the CloudFormation console, launch the Content Designer webpage using the ContentDesignerURL link from the Outputs tab of the master CloudFormation stack. Log in with the administrator username you provided when you launched the stack (default: ‘Admin’), and your new password. If you want to import a full guided navigation example without going through the process of creating the documents, skip to the Full Guided Navigation Example that follows. Otherwise proceed to step 4. In the QnABot Content Designer, open the Tools menu by choosing the ☰ icon in the top-left corner of the Designer and then select the Import submenu item. Choose Examples/Demos to open the list of built-in examples. Locate the guided-navigation item and choose the LOAD button. You’ll see an Import Jobs menu that will load the documents required for guided navigation. After a few seconds, you’ll see text that says “guided-navigation.json: Complete” in the Import Jobs This indicates that the import job has succeeded. Navigate to the Tools menu mentioned in Step 3 and choose the Edit submenu to return to the main Content Designer page. You should see that the two documents, “Next” and “Previous”, have been loaded into the Designer. Let’s modify these default documents to work better for our Prairie Trails tour. Choose the UPDATE button located in the bottom-right corner to update the document. You may add/remove phrases in the Questions field, and change the default answer as you want. We will use the phrases in the previous screenshot for this blog post. Choose the menu button ( ⋮ ) near the top-right corner of the Designer UI. Then choose the LEX REBUILD submenu item to rebuild and publish the underlying Lex Bot. This allows Amazon Lex to understand the new questions that you have entered. You’ll see a progress bar that displays “Success!” upon completion (this may take a few minutes). This rebuilding process allows Amazon Lex to recognize the new questions that have been added. Now that QnABot has the ability to navigate forward and backward using our preferred phrases, we’ll add our first set of documents. We’ll use the first three stops on the trail, Where the Rails Meet the Sails, Pressure + Flow, and Shipment to China. Keep these links open because they will be used in the following sections. If you want to skip the document creation process detailed in steps 1-8, you can import this JSON document into the Designer by copying the URL, opening the Import submenu from the tools menu, pasting the URL in the “from url” section, and choosing the Import button. Open the Designer UI. You should have the “Next” and “Previous” documents that were added in the previous section. On the top-right side of the Designer UI, choose the ADD The Add New Item form should appear. In the document type section, select the qna document type, if it is not already selected. Now add the basic information for each of these stops. When creating a document, we suggest using an Item ID that makes sense for the information in the Document. In our case, we use the stop name as the Item ID. We’ll also add Questions (or phrases) that users might ask, and the answer that will appear when those questions are asked. Both questions and phrases will be put into the Questions field. Use the following values for the form, example pictures are included below. Answer: This paired sculpture and mural features a finger and thumb clasping a steel needle, followed by a trail of stitches. The title takes its inspiration from a late-1800’s promotional slogan for Tacoma, and the mural elaborates on this era in Tacoma’s urban development. Together, these elements tell the story of the Northern Pacific Railroad finding its end at Commencement Bay and the growth of urban Tacoma. Ask for more about the art, the artist, or the medium for additional information. The previous answer document has a line that reads “Ask for more about the art, the artist, or the medium for additional information.” This line will be relevant in the following section when we create a more complex navigation sequence. Choose the Advanced tab at the bottom of the form (you may need to scroll down on the form to see this tab). This tab contains extra features for your documents. In this basic example, we will only use the Next Document field, although other advanced fields may be used. Fill in the Next Document field with the stop name/Item ID of the next stop on the tour, which is Pressure + Flow. When we create the next document, we will use Pressure + Flow as the Item ID. These fields are space and case sensitive. Repeat steps 2 – 7 for Pressure + Flow and Shipment to China using the basic information provided on the linked pages. The “Pressure + Flow” document should have “Shipment to China” listed in the Next Document field, while “Shipment to China” should not have that field filled in for now. Screenshots that show creating the Documents follow. Answer: Commissioned by the City of Tacoma. A two-part installation, Pressure + Flow is a reflection on the power of technology and communication to transform a landscape. Pressure is a sculpture inspired by the inner workings of a steam engine, and Flow involves etched writing applied directly to the historic Prairie Line rails, excerpted from historic documents and letters. Ask for more about the art, the artist, or the medium for additional information. Answer: Commissioned by the Chinese Reconciliation Project Foundation in partnership with the City of Tacoma. This piece commemorates the early Chinese in America, their labors to construct the transcontinental railroads railroad construction, and their unjust suffering. It consists of an antique train truck and abstracted representation of 100 ash boxes, a reference to the Chinese workers who died while building the railroads. Ask for more about the art, the artist, or the medium for additional information. Choose the menu button ( ⋮ ) near the top-right corner of the Designer UI, and then choose the LEX REBUILD submenu item to rebuild and publish the underlying Lex Bot. This allows Amazon Lex to understand the new questions that you have entered. You will see a progress bar that will display “Success!” upon completion (this may take a few minutes). This rebuilding process allows Amazon Lex to recognize the new questions that have been added. Your browser may prompt you to enable microphone access in the client. If you would like the option to use speech, you will need to allow microphone access. Open the Tools menu by choosing the ☰ icon in the top-left corner of the Designer and choose the QnABot Client submenu item. This opens the QnABot Client in another browser tab. We will use it to test our navigation sequence. In the client, either type or use the microphone to ask to “Start the tour.” Because we listed that phrase as one of the questions, you should see the answer for Where the Rails Meet the Sails. Ask to go to the “Next Stop.” Since we linked the documents in the Designer, you should see the answer for Pressure + Flow. Ask to go to the “Previous Stop.” You should again see the answer for Where the Rails Meet the Sails. Ask to go to “Shipment to China.” You should see the answer for Shipment to China, the last stop on the tour. Ask to go to the “Previous Stop.” You should again see the answer for Where the Rails Meet the Sails. The Guided Navigation “Previous” functionality goes to the stop you were previously at (like the back button on a web browser), while the Guided Navigation “Next” functionality attempts to go the next stop on the tour by looking for the Document in the “Next” field. As of this blog post, the “Previous” function can store up to the last 10 documents that were returned. Now that we have basic answers for each of the three stops, we will add additional information about each stop through the use of supporting documents. The first part of this process is to assign a Topic to the document for each stop. If you would like to skip the document creation process detailed in steps 1-8, you may import this JSON document into the designer, by copying the URL, opening the Import submenu from the Tools menu , pasting the URL in the “from url” section, and choosing the Import button. Navigate back to the QnABot Designer tab. Navigate to the Edit Button (🖉) located on the same line of the document with Id “Where the Rails Meet the Sails” and choose it to update the document. Scroll down on the update form and click to expand the Advanced In the Topic field, write “Where the Rails Meet the Sails”. Supporting documents that relate to “Where the Rails Meet the Sails” will use the same Topic. Note: You can assign any value to the Topic field as long as supporting documents use the same exact Topic. In this case, the name of the stop made sense for the Topic. Click the UPDATE button in the bottom-right corner to update the document. You may need to scroll down to the bottom of the form to see it. After the updating screen reads “Success!” choose the CLOSE button. We will now create a supporting document for “Where the Rails Meet the Sails” with information about the artist. On the top-right side of the Designer UI, choose the Add The Add New Item form should appear. In the document type section, select the qna document type if not already selected. We will use the “Meet the artists” section on the Where the Rails Meet the Sails webpage to fill out the form. Repeat steps 2 – 7 for Pressure + Flow and Shipment to China using the information from the respective webpages and using the correct Topic. Examples follow. Choose the menu button ( ⋮ ) near the top-right corner of the Designer UI and choose the LEX REBUILD submenu item to rebuild and publish the underlying Lex Bot. This allows Amazon Lex to understand the new questions that you have entered. You’ll see a progress bar that displays “Success!” upon completion (this may take a few minutes). This rebuilding process allows Amazon Lex to recognize the new questions that have been added. Your browser may prompt you to enable microphone access in the client. If you want the option to use speech, you will need to allow microphone access. Open the Tools menu by choosing the ☰ icon in the top-left corner of the Designer and choose the QnABot Client submenu item. This opens the QnABot Client in another browser tab. We’ll use it to test our navigation sequence. Ask “who made this?” You should see the answer for Where the Rails Meet the Sails: Meet the artists. Ask “who made this?” You should see the answer for Pressure + Flow: Meet the artist. Ask to go to the “Next Stop.” Since we linked the documents in the Designer, you should see the answer for Shipment to China. Ask “who made this?” You should see the answer for Shipment to China: Meet the artist. Ask to go to the “Previous Stop.” You should again see the answer for Shipment to China. Ask to go to the “Previous Stop.” You should see the answer for Pressure + Flow. Ask to go to the “Previous Stop.” You should see the answer for Where the Rails Meet the Sails. In some cases, you may want to offer users a choice in where they want to go next. Looking at the Prairie Line trail we can see that there are a few instances where this may be helpful. Suppose that you are at the Joy Building, you may want to cross Pacific Avenue and go to Union Station. Or you may decide that Union Station is out of the way, and you would rather go directly to the West Coast Grocery instead. Although you can only specify one next stop to go to, you can use an extra document to prompt users to say the name of the stop that they want to go to next. A sample flow chart follows. While there are no direct links between the Options document, the Union Station document, and West Coast Grocery document, you can prompt users to ask a question that will lead them to their preferred next stop. In this example, we prompt the users with their options if they ask to go the next stop on the Options document. You could optionally guide users to a default next stop as an alternative. This technique works in conjunction with all other features of guided navigation. This example JSON document contains the previous example of branching. You can import this into the Designer by copying the URL, opening the Import submenu from the tools menu, pasting the URL in the “from url” section, and choosing the Import button. After importing the set of documents, perform a Lex Rebuild. Ask to go to the “Joy Building” to begin this sequence. A full example of guided navigation is available here. You can import this into the Designer by copying the URL, opening the Import submenu from the tools menu, pasting the URL in the “from url” section, and choosing the Import button. After importing the set of documents perform a Lex Rebuild. This example uses the navigation techniques described earlier, along with the response card and markdown features described in the original QnABot Blog to combine imagery and text formatting to create a guided navigation experience. Ask to “Start the tour” to begin this sequence. Guided navigation was built as a set of example Lambda hook functions that can be imported into the QnABot system. The Python code can be easily viewed in the AWS Lambda console for the Next-PY and Previous-PY functions (the function names will also have the Cloud Formation stack ID in the name). The two Python functions work in conjunction with the Query Lambda function to properly perform guided navigation. The code for all three functions can also be viewed/downloaded from our GitHub repository (Previous, Next, Query). The guided navigation functions set session attributes in the client. In our implementation of guided navigation, we create a “navigation” session attribute in addition to the “topic” and “previous” session attributes that QnABot already keeps track of. The “navigation” session attribute keeps track of “next”, “previous”, and “hasParent”. The next document in the sequence. The information is from the Next Document field on the latest document returned to the client. This field can be filled even if the user did not specify a “Next Document” – this is why the “hasParent” sub-attribute exists. The previous documents returned to the client. Amazon Lex session attributes are limited to 12 KB as of the publication of this blog post, so we manage consumption by keeping track of the previous 10 documents returned to the client. Although we have not exceeded this limit yet, as more features are added to QnABot, more space may be used in the session attributes section. If this becomes an issue, Amazon DynamoDB could be used to store longer sequences and more attributes, although realistically users would most likely not backtrack more than 10 steps in a guided sequence. Whether or not a document has a parent, this attribute is opaque to content designers. In a previous section, we added supporting documents to QnABot that are intended to provide additional information about the parent document. Because the supporting documents do not specify a “Next Document”, guided navigation pulls information about the “Next Document” from the previous document returned to the client, and sets the “hasParent” flag to true. This is why users are able to go to the next room from supporting documents. Documents that have “hasParent” set to true are not added onto the stack of documents in the “Previous” field. Users would generally like to go back to the previous stop in the tour when they ask to go back, not to the additional information about that supporting document. The guided navigation functions also make sure that a document is not listed multiple times in a row on the “Previous” sub-attribute stack. In the section about branching paths, the options document lists itself as its own “Next Document”. If a user were to say “next” multiple times on that document, it would be returned multiple times to the client. The document will only be added once to the stack. You can integrate the tour feature with the regular features of QnABot or other custom functionalities. You could integrate trivia quizzes into your tour (which will be described in a future blog), and test your knowledge before and after the tour. Or you could implement a feedback system in which users can comment on the information in your bot. Guided navigation is only one of the features that you can add to your bot. Although we only used the QnABot client in this example, you can also create an Amazon Alexa skill to offer guided tours. It is very easy to make an Alexa skill for your tours. The Tools menu in the Content Designer has an Alexa submenu item that will guide you creating an Alexa skill from your content. 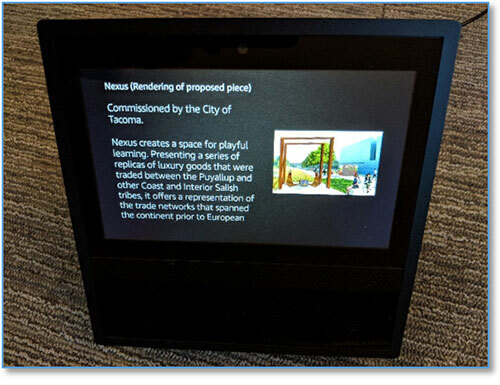 Response cards look great on the Amazon Echo Show or on the big screen TV using Alexa on FireTV. This blog showcases the new guided navigation feature of QnABot. We provide examples of how to create your own guided navigation sequence, and we illustrate the different scenarios that you can create. We also explain some considerations that went into designing guided navigation. We thank the City of Tacoma Historic Preservation Office for allowing us to use the Prairie Line Trail as an example for this blog post. Arun Donti is a Consultant for AWS Professional Services. Bob Strahan is a Senior Consultant for AWS Professional Services. John Calhoun is an Associate Solutions Architect for the AWS Public Sector Partners team. They work with our customers and partners to provide leadership on a variety of projects, helping them shorten their time to value when using AWS.